C5/M1KTA QRV again after thunder for hour. KX3 Build - RF board - an issue. OK I didn't manage DXCC myself from either C5 or 6W but I did manage to achieve more than 100 DXCC 'slots' which is the combination of DXCC and band/mode for RX stations. I managed 113 DXCC slots and 59 DXCC from both combined. Three videos, the antenna,the station and the rain and boy oh boy did it rain. I didn't capture any thunder and lightening but it sent C5/M1KTA QRT 4 nights in a row and the powercuts that followed one lasts through Sunday. Many thanks all for the support and I hope I managed to work you on air. I'm off to Banjul then up to Cape Point should be QRV 20m and 15m (SSB) about 15:00 UTC for as long as the battery lasts, or the qso's do. nice series of qso on 20m this morning. 14.048 up2, still running qrp only and signals weak, got a lot of local qrn but bands quieter. w/e full of contest stations and could not make qso as no response so became a tourist on Sunday. This afternoon 27th will try /P from beach on 15m/20m with buddipole in versatee vertical configuration. Thanks everyone for implied concern. Probably have a bit of solo dxpedition lethargy after running lots of hour long cq cq cq sessions until that first qso then ungodly pile up for an hour as have been spotted. 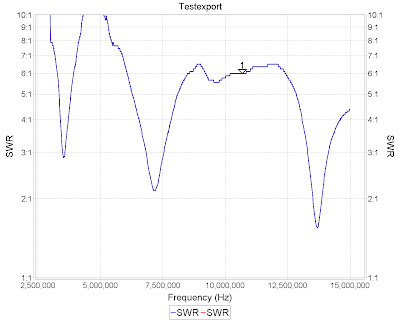 So listening to the bands more than in 6W, large swl report list, especially VK's and pacific stations. I brought FT897 which can do 100W but I have left that in case and sticking at it with the KX3 and qrp as it is a mission now to complete whole trip qrp. I have worked out CW split with KX3, dual watch and ran first ever cw pile up (scarey) into NA last night running split up 2... worked but I had to cheat and use cw get as the practice of one time call response meant lots of pse agn and qrz, tuning stations in was not easy. Some UK stations in log last night MD0CCE but I know he has a huge setup, had plenty UK stations SSB so no idea why no others as I thought cw would make it easier ho hum. I am at 12wpm from pc no hand key as broke the palm paddle connector so sending correctly. 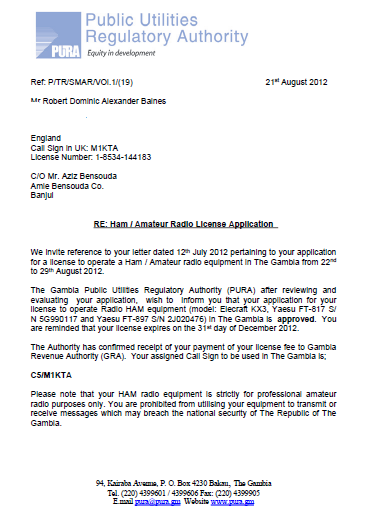 RTTY with KX3 now too but not gone on air with it yet. RX conditions for me are much poorer that 6W, put that down to the G5RV (as inverted V) which is running due north south which probably does not help for UK. 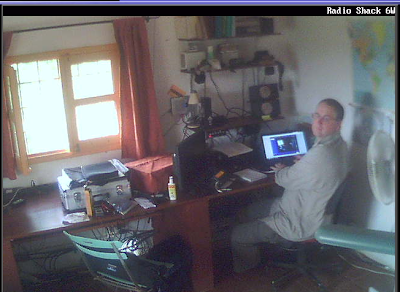 PA getting too hot sometimes as ambient temp doesnot help so radio folding back to 3W sometimes. Why oh why 2.5mm socket on the SDR I/Q if only I had an adapter! Just tried again but no luck so not going to get permission to go to AF-060. Expect will be /P from beach. New 12V 9AH battery (Motorbike cost 475 Dalasi and it is 49 to £1 let you do the maths) so much cheaper than AA batteries. Station will be buddipole in a vertical setup right by shore, using KX3, Monday afternoon 27th August I expect. Will be qrt before local sun set, will not be safe to remain on the beach after dark. Subject: Re: [GQRP] Fw: Fw: Doing the QRP DX bit... again! Peter (he is in the 6W log 2x qrp SSB using G3JFS and GO3JFS) has asked me to try cw again so will do so, want to try to work gqrp members, I have no hand key though just through pc, I broke the connector plug to the palm paddle. I will be qrv on 20m between 14.040 and 14.050 listening up 2 in evenings, even the M3 and M6 stations are getting through on 10w ssb with rst 43 to 56 so cw should be easier. I will be 12 wpm or there about, short rubber stampish qso only though. All contacts are being recorded at this end. I even arranged this through a legal firm INSIDE THE GAMBIA. Listen between 14.260-14.288 as should be in there somewhere in evenings. All started off with a call to 6V7Z when I was qrv as W1AF and I managed to operate from a wonderful DX radio location. Here are my hosts Corrinne and Francois Lorne outside the front gate as I was leaving. Very quickly put up a buddipole and managed a couple contacts with OH1JO and OH1TD @ 14.282 they were calling cq south america and after no takers I thought I'd call with both I am about 41-44 so pretty poor but possible. 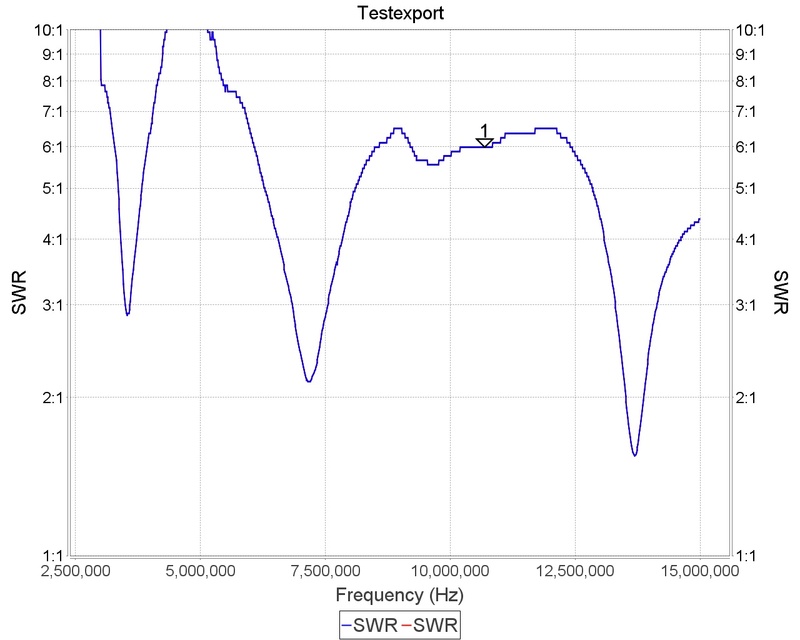 VSWR according to the mini vna is 1.9:1 before I use the tuner. I will put a G5RV tomorrow morning as Yaya has sorted out a nice long pole for me to use as a support, I have the two 10m fishing poles as well. If the house location does not end up being great I might relocate towards the beach but if contacts are possible that is all that matters. I might focus on data modes if easier. House has AC so I set it at 24 and it feels very cool which is a complete contrast to 6W. I do not mind someone trying to earn a bit extra in a place like this if they had initially just asked for $20 maybe but $200 no chance that would have cost more than the whole stay in Gambia! 6W/M1KTA now QRT... see you all as C5/M1KTA tomorrow night. On 15m 5 mins G4MHK heard me and the pile up started. Ended when band propagation changed and I could no longer hear anyone. Back on mainland and on 20m again. 15m 3el yagi, 2m yagi above. The 20m 3 el, 10m 3 el and a 10/15/20 permanently towards NA. Will be limited tomorrow as no yagi just a GP antenna and buddipole. Had pile ups most bands whenever been on them (video and audio recorded on most, band width too low to upload will do when home) and I am qrp but nothing on 160m or 80m I have S9+ static and even when I can hear anyone they are deaf to me hihi no change when qrp in UK on 80m or 160m :-). Getting through all the bands and modes, rtty last night and psk this morning. Those with 30m and ARGO please have a look for QRSS3 beacon 6w/m1kta/ik14ll as it is up and running. I will take same setup to C5 from 22nd. On 10m, 15m or 20m all have been open to UK at various times of the day and worked M3 and M6's with 10w both end so qrp is definitely possible. I have 6m, 12m and 17m but only one 17m contact (one of the 2012L stations) and I arranged that on air with a station on 20m. 2m eme didn't work so abandoning the antenna and coax here. I will welcome reports please save any captures and save for my return after 29th. Beacon on a car battery and will remain running until I leave on 22nd. > land. Please keep an eye out for him. was off frequency and out of band it is now corrected. Or email them to me here as I have internet here in 6W.